Following That Retired Guy's (TRG) last post on AAPL, the stock has not exactly moved in line with his predictions. Probably it should be expected that when you stick your neck out with a public statement, fate is sure to prove you wrong. TRG is not deterred, so he's going to tempt fate. He's going to double down. He's going to talk about how AAPL stock has become ridiculously cheap. 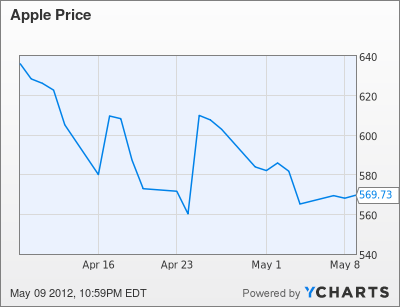 But as TRG pointed out, AAPL's stock price growth was already struggling to keep up with it's earnings. Now the situation has become a little ridiculous. 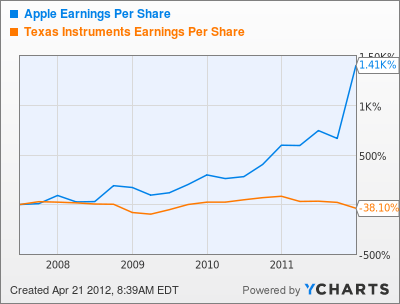 Basted on AAPL's current close and trailing earnings, the stock has a PE Ratio of 16.32. If anyone can argue that that PE makes sense for AAPL, please comment, TRG would love to know what he's missing. Keep in mind that 16.32 is based on trailing earnings, and that AAPL's balance sheet cash translates to approximately $100 per share which technically should be removed before calculating PE (if you remove it, current PE is even lower). Depending on who's estimate of future earnings you use, you are likely to come in with a number somewhere around 12! Daniel Tello is respected as one of the most accurate independent Apple analysts (independent's are more accurate then pro's on Apple) and his forward looking PE is around 10. TRG would sell Apple if it's earnings PE got much above 25 (that is, 25 trailing earnings, the TRG limit is 20 on forward earnings), but at 16, it seems a bargain. 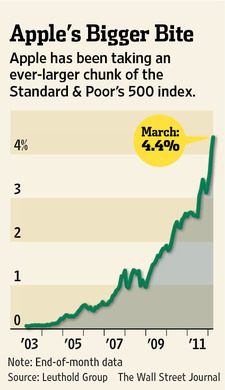 PE for AAPL has been lower, but that tends to be only just after earnings are announced. Since AAPL tends to beat all earnings estimates, the high earnings cause the PE to become deflated, but this situation is usually rectified within a few days of trading (by a rocketing stock price). For example, see last April. Price to Earnings (PE) is a crude measure, but it captures the general idea that a dollar earned different companies and sectors does not have the same impact on the company's/sector's value. There are some good reasons for this. For example, if the company high risk, or highly leveraged, or facing low growth prospects then the stock price should reflect this, and the resulting PE should also be lower. In the case of AAPL, given that the first quarter earnings were so high (one quarter being as much as the whole first half of 2011) the fact that their PE has come down since last year (it was over 20 a year ago) is very hard to square. Is this actually suggesting that the next 3 quarters will be LOWER then last year? Certainly the analysts making estimates don't think so. AAPL has no loans, and therefore, no leverage at all. From this standpoint, it's a pretty low risk company. Although earnings have been volatile, they tend to be volatile only to the positive side. AAPL has not had negative earnings in recent history (you have to go back about 10 years), and even the worst Apple doomsters would never dare to suggest that Apple will have a quarterly loss this year (or next).